Sour is a bit of a pleasure and pain taste, but in the right proportions it really brings a recipe to life. Interestingly I love sour foods from the dairy range such as cheese – especially cream cheese and goat cheese – buttermilk, creme fraiche, sour cream and yoghurt. I’m not partial to sourness from fruits or vegetables although I do love sour cherries and occasionally really lemony tarts. So when exploring sour drinks I steered away from citrus based ones like the Whisky Sour and went for dairy based ones. Fermented dairy products are popular drinks around the world and are thought to be helpful for digestion. They have been around for thousands of years and have been made from a variety of different dairy products such as camel milk or mare milk! While researching these drinks I was reminded of a drink that I used to make for myself, which I called Moon Milk because it was so white. 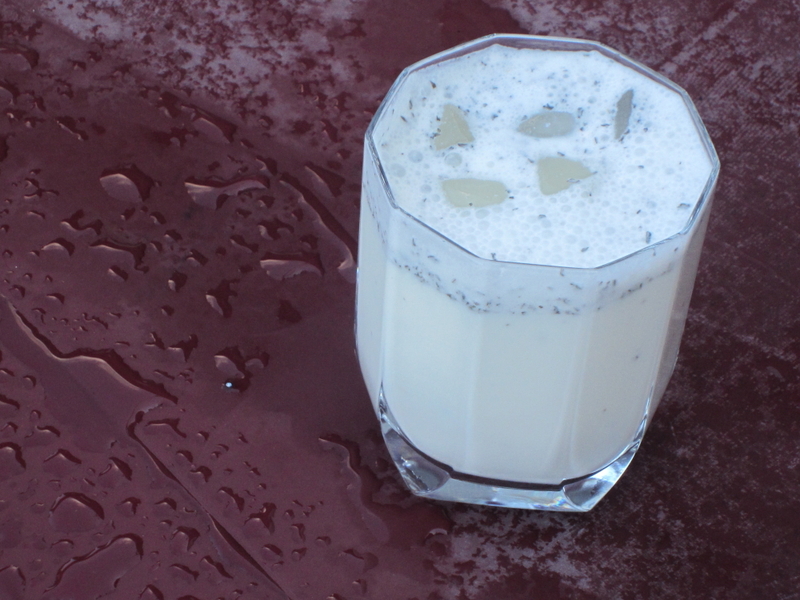 My Moon Milk was simply yoghurt mixed with milk and seasoned with a pinch of salt. This led me to choose a yoghurt based drink to celebrate sourness. Indian lassis and Turkish ayran are probably the more well-known yoghurt drinks, but I chose Persian doogh, mainly because I have newly acquired and much loved Persian relatives. I also love how the sourness of yoghurt is tempered by the refreshing mint. Place the yoghurt, mint and salt in a jug. Mix until the yoghurt is smooth. Add the soda water and mix until combined. So sorry about your health issues Candy. You are always in my thoughts. Opps, commenting from a cell phone leaves much to be desired. Anyway I find the need to develop good practices, difficult for several reasons, I am truly pleased to discover positive motivators are a plus. I am always looking for low salt, healthy, not too sweet, not too intense fermented yums. I do believe this it a top competitor. Thank you so much, Babe. You, are magic. And like several others I met through your American co-author, you inspire me to be a better person. Thank you. Blessed Be! I’m so glad this is a recipe you can try. Your doogh sounds delicious and looks yummy have tried different variations must give this one a go.